I’ll be speaking and signing at Greensboro NC’s annual GreensboroBound festival! SE-YA Book Fest is a FREE one-of-a kind of event that will take place in March of 2018 on the campus of Middle Tennessee State University in Murfreesboro, TN. It is designed to place teens and authors of young adult literature in a setting to interact about what they love most -- YA lit! Much like how Anouk's Beastie existence prohibits her from leaving the confines of her prison walls in Grim Lovelies, author Megan Shepherd will make a mystical and magical appearance via Skype to join us digitally live here at RJ Julia! Will you be at NCTE/ALAN? YA Panel “Enchantments Retold, Twisting Fables” with A.G. Howard(Abrams), Brigid Kemmerer(Bloomsbury), Megan Shepherd(Houghton Mifflin Harcourt), and Chaired by Suzanne Metcalfe, Diamond High School, Anchorage, AK. Open to all ALAN attendees. Update: I’ll also be participating in the Friday afternoon special event YALLCRAWL! EpicFest is an extraordinary, free literary festival that brings children, teens and families together with authors, illustrators and the Library. Produced in conjunction with Verse & Vino, this event welcomes book-lovers of all ages into a community of readers. The 4th annual EpicFest will be feature award-winning children/young adult authors and illustrators. On Friday, November 2 our guests will visit select CMS schools, and Saturday, November 3 they will be featured at an all-day festival for children and families at ImaginOn. Following the daytime festival, the young adult authors will participate in a book talk and signing for teens and others interested in young adult literature. I'll be at my hometown bookstore on Oct 30 for a pre-Halloween book signing with giveaways, macarons, and a candy buffet! Come get your book signed and hear the story behind Grim Lovelies. Can't make the event? You can preorder copies of Grim Lovelies from Highland Books and I'll sign them for you to pick up (or they can ship) later! Read Up, Greenville is an annual celebration of Young Adult and Middle Grades books and authors. There will be book sales, author signings, panel discussions and keynote speakers. The day will feature multiple panels specific to different themes. Megan Shepherd will attend as a speaker and sign books! 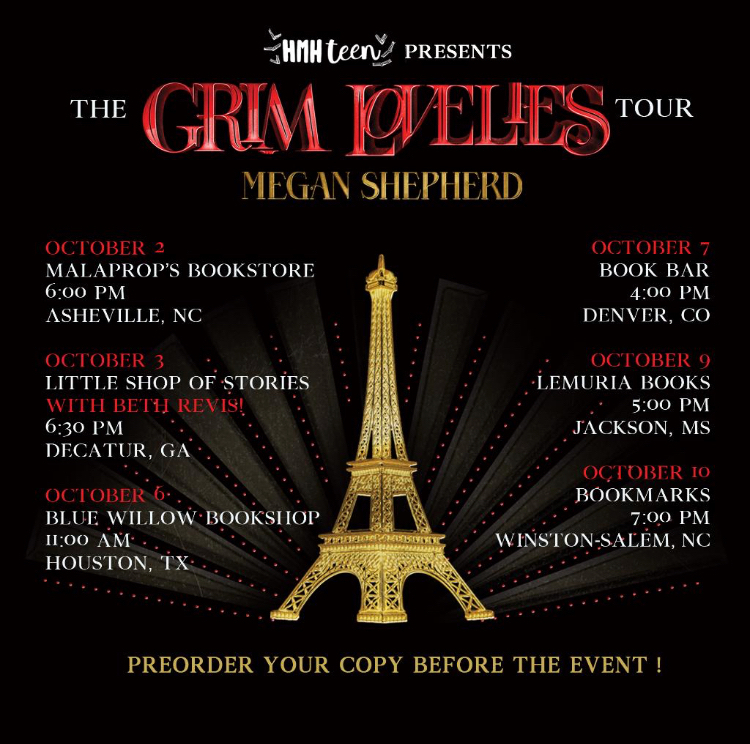 Megan Shepherd will discuss her book Grim Lovelies, the first in her new YA fantasy series! From the bestselling author of The Madman's Daughter trilogy comes Grim Lovelies, a darkly enchanting young adult fantasy where fighting to stay human means trusting the dark magic that started it all. Megan Shepherd is the acclaimed author of The Madman's Daughter trilogy, The Cage trilogy and the middle grade novel, The Secret Horses of Briar Hill. She lives and writes on a 125‑year‑old farm outside Asheville, NC. Join bestselling authors Megan Shepherd (Grim Lovelies) and Beth Revis (Give the Dark My Love) for an amazing evening of YA fantasy! This conversation is not to be missed. This event is free and open to the public. Be sure to purchase a copy of at least one of these titles in order to earn a place in the signing line! GRIM LOVELIES Launch Party at Malaprop's Bookstore! I’ll be visiting Asheville area schools during the day, and at 6pm in the evening, come join me for a book talk and signing free to the public at Malaprop’s. We’ll have French macarons, a candy buffet, themed cupcakes, swag, and of course, books! GRIM LOVELIES Tour: More Stops Added! With fellow authors Beth Revis, Court Stevens, and Mindy McGinnis, I'll be visiting select middle and high schools across Tennessee.